The album sized reprints of Uncle Scrooge and Donald Duck comics produced by Gladstone and Disney - the perfect size for those stories! The theme song to Nextwave. 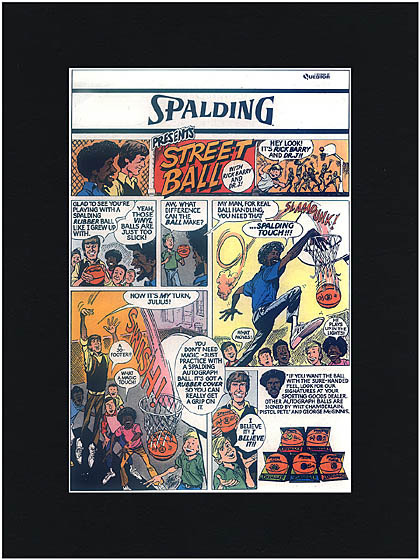 The ad for Spalding basketballs drawn by Jack Davis, starring Rick Barry and Dr. J, that ran on the back of every comic book published for about 4 decades. The Tandy WhizKids helping out Superman with a TRS-80, of all things. The Joker talking about boners. The Marvel Comics Video Library, produced by Prism Entertainment. I must've rented the whole series over the course of one winter back in grade school. The fact that any DC book you own from circa 1983 probably has the "Masters of the Universe" preview insert in it. There was no escaping that damn thing! Nova, the Human Rocket - the only superhero guaranteed to be a bigger loser than you! The fact that I'll get to introduce Liam to all of this and more.